Arabs threw an explosive device made up of fireworks in Gush Etzion. Their vehicle had an Israeli flag on it. Arabs on Thursday evening threw an explosive device made up of fireworks at the Karmei Tzur junction in Gush Etzion. 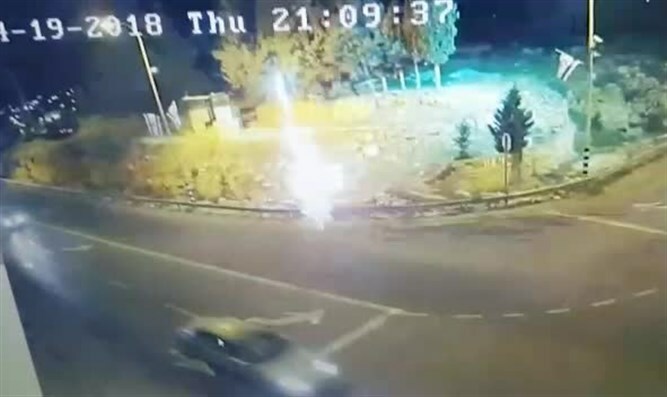 The fireworks hit an Israeli vehicle. There were no injuries but the vehicle was damaged. An initial investigation revealed that the vehicle in which the Arabs were traveling had an Israeli flag in its window. IDF forces are searching the area. The residents of Karmei Tzur have said that in recent weeks, Arabs in the area have been using a similar method, throwing explosive charges that are composed of fireworks and fleeing the area. In addition to the incident in Gush Etzion, a Jewish man was lightly injured on Thursday evening by a firebomb thrown by an Arab in the eastern Jerusalem neighborhood of Kfar Shiloah. He was treated by Magen David Adom paramedics and evacuated to hospital.